We’re all about enhancing well-being, managing daily stressors, performance and purpose – while creating a healthier relationship with technology. When we heard about a new fitness site that makes it easier to workout, train and indulge your inner workout warrior… we couldn’t help but share. Insert Go2Practice: The only comprehensive fitness search on the web to make finding fitness anywhere, anytime simple showcases a database with over 100,000+ fitness options across the United States in one convenient place. We were lucky enough to chat with longtime fitness guru Joanna Stahl who is now the founder and CEO of Go2Practice to discuss the site and more! I learned that you have an extensive fitness background. As a successful woman in a male dominated industry, I’d love to hear more about your past career experiences and what lead you to launch Practice. Joanna Stahl (JS): Fitness is a personal lifestyle for me that began years before I ever envisioned a career in the industry. Coaches, trainers and gym friends have always been an incredible social community and proudly, some of my closest friendships began through “practice” aka sports and fitness. While the fitness industry is primarily owned and operated by men, there are some amazing female leaders in the space. These ladies have not only dominated the group fitness explosion by driving much of the content advancement, they are also business owners and responsible for much of the direction of this industry phenomenon. Men may have an easier time funding their dreams, however, the industry is very welcoming and supportive of women looking for how to grow the industry in one way or another. My career began in marketing for prenatal women through print, sampling and events. Next, I dove into custom publishing for smokers and high-end car manufacturers until I found my sweet spot within the fitness industry. Aligning your passion and career path is definitely the way to go! At that time, I was empowered to build partnerships for brands who wanted to engage with fitness consumers and was able to utilize creative strategies since we owned the environments. Examples include branded group fitness classes that were focused around heart rate training or inspired by boxing to sampling programs around heart health, and healthy salad trials to promotions around deodorant benefits that tied into gamification of your workouts. There were expected operational hurdles, however, the sky was the limit, and this led to my next adventures focused on fitness business development and fitness partnerships. The thought process behind Go2Practice came from watching the industry evolve. Members were becoming more transient, gym owners were willing to accept day rates, people wanted to maintain their fitness routine while they traveled and were overwhelmed by all the available options. Much like what has happened with the travel and transportation industries, people want options. Consumers’ habits are causing businesses to shift towards empowering their decisions. Fitness consumers are demanding options and are willing to pay for what they want, when and where they want it. This trend is showing exponential growth with over 20M people spending $20+ a month on fitness experiences beyond their memberships. 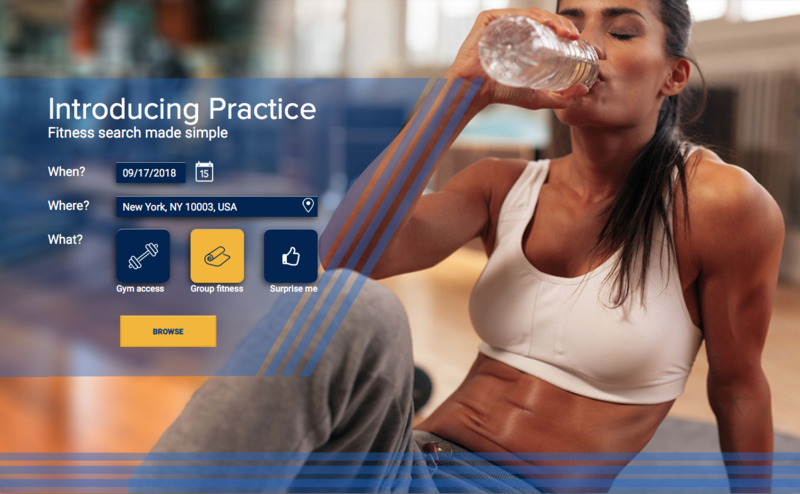 At the core of the business, Go2Practice is a search engine which provides information on all of the workout options surrounding consumers, without limitation. Go2Practice meets them wherever they are and directs them to preciselywhat they want to find.Or, if they don’t know exactly what they want, it’s easy to head to the “surprise me” tab to generate ideas. As a non-technical founder, I’ve learned a lot on the fly and trusted my technical experts. During the stealth startup mode and development time, my past experiences have been invaluable. The network of advisors has proven to be one of my most valuable assets. I’ve been able to leverage my past few decades of connecting people within the fitness industry, advertising and marketing of brands, deal flow and how to engage fit fiends so they know Go2Practice is built for them… by one of them! What is your favorite Practice feature? JS: If I can only choose one, it would have to be the “Surprise Me” feature. This currently showcases clubs that are offering specials. We will be launching our “influencers’ stamp of approval” locations followed by a “prescribe for me” section to review your workout history and your personal preferences. The “Prescribe Me” feature might be a communication such as “Hey, you have a triathlon coming up, do you want to hit this club on State Street? They offer a pool, Woodway treadmills plus a cycling class so you can practice it all!” This feature is in development right now and we are hoping to launch in the fall- stay tuned! Are there ‘women only’ facilities listed on Practice? JS: Yes, of course! Go2Practice aggregates all fitness pay to play options across the US and the database has over 100,000+ facilities currently. Do you find that more women are using Practice as opposed to men? JS: The fitness industry is close to 50/50 overall. However, since group fitness is dominantly female, yes, women are and will be the higher audience percentage. I also believe that women are more likely to seek out other fitness experiences when “on the go.” I’ll let our research prove this theory in the upcoming months. Go2Practice has some fun and useful back-end research features that will be collected for sharing with gym partners soon! Do you believe apps like Practice are the way of the future? JS: I do believe that customer empowerment is the way of today and the future. People want options, access, information at their fingertips, rewards for their efforts, and a sense of community within their fitness endeavors. My goal with Practice is to listen to both owners and members to enable a nationally seamless platform. A place where gym/studio owners operate the way that is best for them and consumers gain access to that information to decide what their next amazing workout will be, all on demand and with ease. Why should the fitness obsessed download and use Practice? JS: These are the 20% of gym members and inclusive of those membership phobic people who are currently searching weekly/monthly for their next fitness experience. We are 20M strong and growing. Go2Practice is a mobile-enabled site with an app icon for easy open use. We are the most inclusive fitness search on the web to find your next amazing workout, anywhere, anytime you are ready. We can’t wait to see where Practice takes us next. Looking for your next workout? Traveling for your BFF’s bachelorette and need a quick sweat session on-the-go? Just want to learn more? Visit www.go2practice.com and you’ll thank us later!